InDesign scripting : lesson 22 showed an applescript that exports a pdf from InDesign and attaches it to an email — adding a subject and recipient along the way. 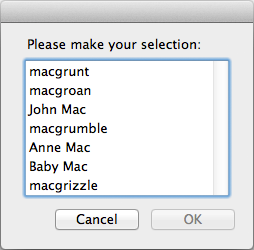 here’s a variation that lets you email an existing file directly from the finder. the previous script used a predefined list of email addresses — this one accesses your address book. 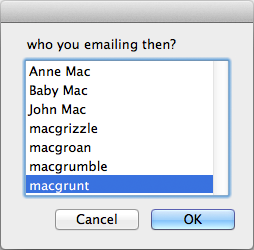 choose from list mgSortedPeople with prompt "who you emailing then?" put all those bits together, customise it to your particular way of working, and you’ve got yourself a handy little timesaver. there are a number of ways to activate a script like this, but the easiest is to turn it into a service so that you can activate the script with a right-click or keyboard shortcut. see get file path of finder items which shows how to do this through automator. 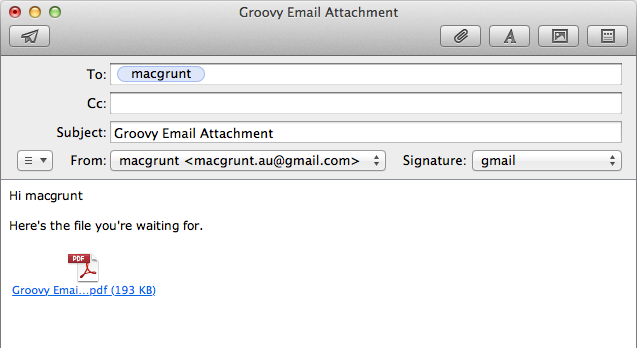 the next post will show how to convert this script to allow for multiple attachments and multiple recipients. This entry was posted in applescript, Finder, OS X and tagged applescript, attachment, automation, email, finder, how to, Mail, tutorial by macgrunt. Bookmark the permalink.